State lawmakers are likely to approve a measure to require the inspection of lakefront septic systems whenever a property changes hands, a regulation already in place for seaside properties. AUGUSTA — In a bid to preserve water quality in Maine, there is a good chance state lawmakers this year will extend rules governing coastal septic system to property bordering the state’s many inland lakes. The proposal would mandate that septic systems near lakes be inspected before any property within the shoreland area is sold, something that has been required along the seacoast since 2007. Faulty systems would have to fixed. Mandating inspections would “preserve the water quality of our valuable great ponds and protect lake shorefront property value, the interests of lakefront property sellers and purchasers, and the property tax income of many Maine towns,” Susan Gallo, executive director of the Maine Lakes Society, told legislators recently. Though environmental groups are solidly behind the proposed change, not everyone is convinced. Andy Cashman, a Freeport attorney, told lawmakers the Maine Association of Realtors believes “well-informed buyers are fully capable of making the best decision” about inspections without the state mandating one when property is transferred. Cashman said it is “nearly unheard of for a buyer to decide not to have a septic system inspected, but it ought to be their decision,” not one required by the state. Rendering of how a septic field operates, from a brochure produced by the Cumberland County Soil and Water Conservation District and the Casco Bay Estuary Partnership. Required inspections are an idea the Legislature has already endorsed. In 2017, a similar bill passed easily but fell victim to a veto by former Gov. Paul LePage, who expressed concern about the expense of the proposed requirements. Advocates said the expense is minimal, typically about $150, compared to the potential economic and public health impact of a decline in the quality of the water in Maine’s lakes. When septic systems do not work properly, they pose two significant threats. One is that they can become a source of waterborne illnesses for people swimming in lakes or streams. The other is that they discharge an excessive amount of nutrients and wastes that contribute to algal growth that can turn pristine ponds into gloppy, green messes. Paul Hunt, environmental manager for the Portland Water District, told lawmakers Sebago Lake, a key water source for Portland, is a good example of why the legislation is needed. Calling the lake “enormous, deep and cold,” Hunt said it remains pristine enough to supply 200,000 people with water without the need for filtration. “If the septic systems are built and functioning properly, they can do it,” he said. 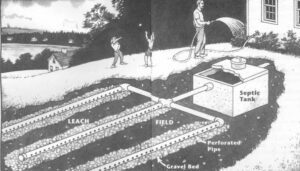 How a septic field works, as shown in a brochure from the Cumberland County Soil and Water Conservation District and the Casco Bay Estuary Partnership. Hunt said it is important when a property changes hands that a qualified professional inspects the system to make sure it is operating correctly and will protect the lake and the buyer who might otherwise face a costly tab to replace it. Bruce Bates, director of the Maine Center for Disease Control and Prevention, told lawmakers more inspections are needed. “Malfunctioning septic systems are a significant threat to public health and are often ignored by property owners,” Bates told the Committee on Environment and Natural Resources. “Water quality of lakes in Maine is at great risk. Their decline is imminent without our vigilant protection,” said Vienna resident Lidie Robbins, executive director of the 30 Mile River Watershed Association that protects more than 20 lakes and ponds in Androscoggin, Franklin and Kennebec counties. “Septic systems don’t get the attention as do other threats to our lakes, like invasive plants, but there is no question that they are a threat,” she said. Robbins told legislators many property owners do not consider the “impacts” of their septic systems, in part because they often come from places with municipal sewers and are not familiar with septic systems. “They do not know the ages of their systems, their capacity, how to maintain them or whether they are functioning properly,” she said. Robbins said septic inspections rarely occur unless a neighbor complains or a bank requires it for a mortgage. Moreover, she said, the use of lakeside property has changed greatly in recent times, with more year-round residents and many seasonal rentals to larger groups that might overtax old systems. “People depend upon the government creating and enforcing appropriate lake-protection laws, such as shoreland zoning, to ensure that they do the right thing for their lakes,” she said. “We should be doing all we can to make it easier and less expensive to buy property and live in Maine, not harder,” LePage wrote. But advocates said requiring inspections is worthwhile for buyers and the general public. Nick Bennett, a staff scientist for the Natural Resources Council of Maine, said that when he bought his house, getting an inspection made sense. “It was very inexpensive and gave me peace of mind that l would not have the large expense of putting in a new tank or leach field right after making the biggest purchase l have ever made.” Bennett said. A failing septic system can leak bacteria and nutrients, such as nitrogen and phosphorus, into groundwater that often winds up in lakes, streams and the ocean. 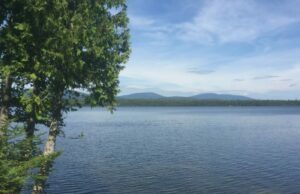 Eliza Donoghue of Maine Audubon said lakes retain about 90 percent of what flows into them, so a buildup of nutrients can lead to algal blooms that decrease oxygen in lakes and threaten wildlife and fish, including trout and salmon.